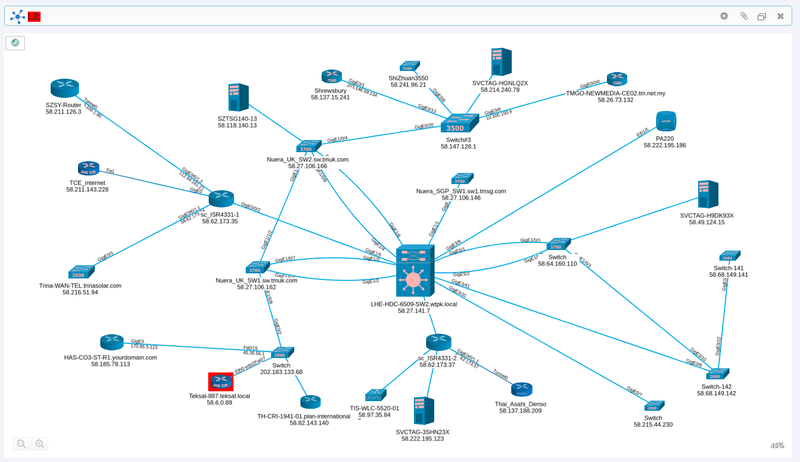 In this chapter, you’ll learn how to generate a map of the L2 Topology for your site. 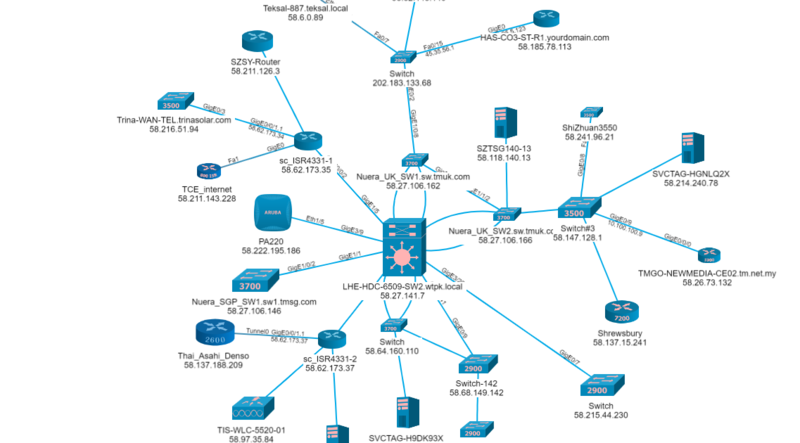 An L2 Topology shows the physical connections between devices, which can be extremely useful for maintenance and troubleshooting. The topology can display real-time up/down status information along with other relevant information about the site. 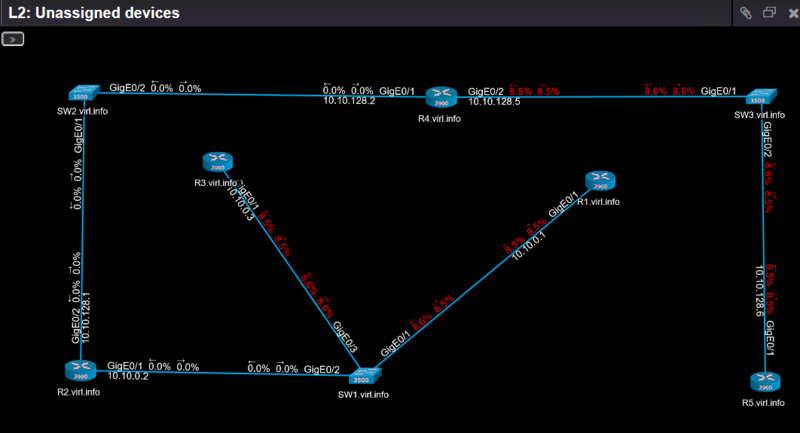 You can generate an L2 Topology for any site in just a few steps. 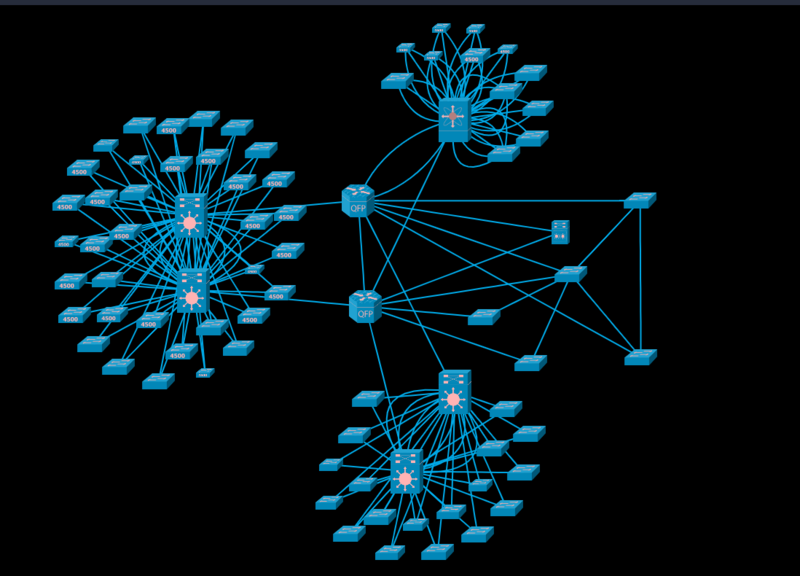 The devices that appear in this topology are those that were found during the nightly site discovery operation. In the Sites Panel on the Nectus Home Screen, open Sites and right-click the Site you want to work on. 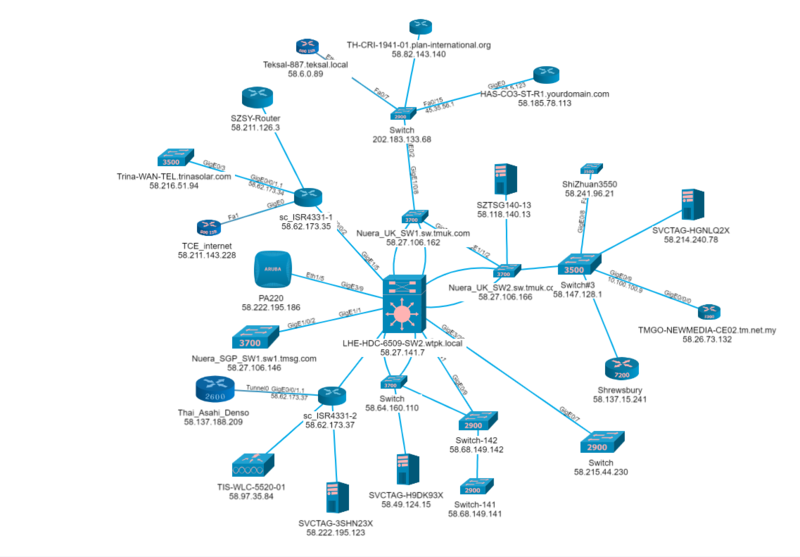 Click Create L2 topology of this site to open the Generate Topology dialog. Select the devices you want to appear in the topology then click Generate Topology. After a moment Nectus displays the site’s L2 Topology. 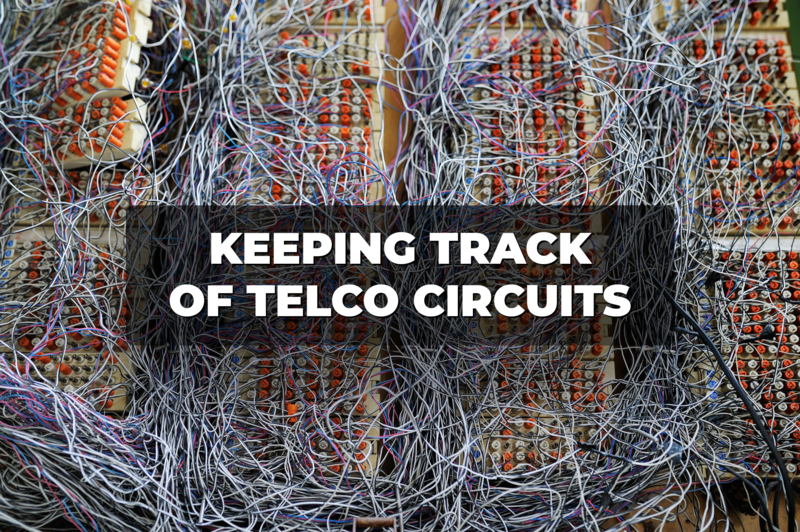 The L2 Topology displays the physical connections between the devices at the site, along with information about those connections. You can drag the entire Topology around the window, as well as drag and resize individual devices. 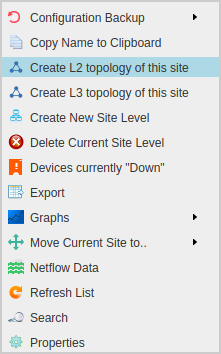 Click Settings in the L2 Topology window to open the Settings dialog and customize the information that appears in the Topology. Assign the Topology a Title if you plan to reuse it. 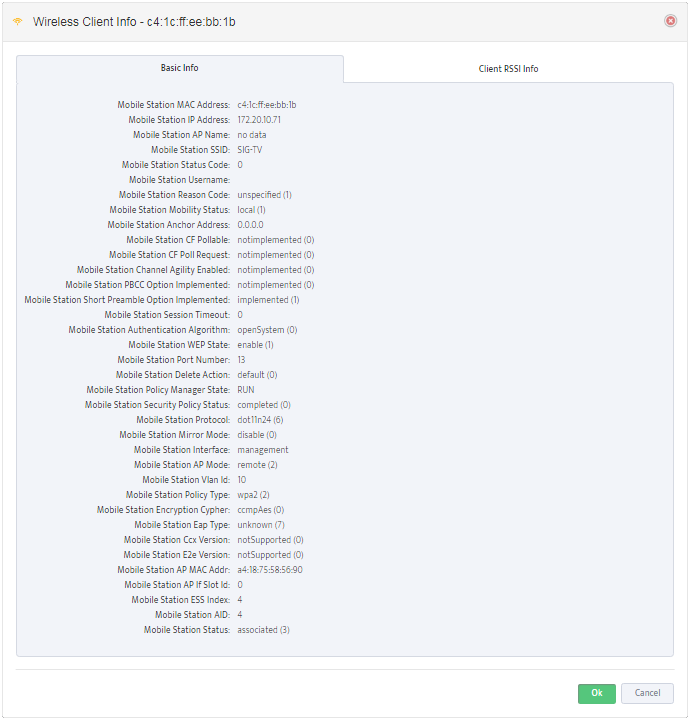 In the Device Info tab, check Up-Down Status and the type of alert (Color Alert, Audio Alert) for real-time alerts when a device in the Topology is down. With Color Alerts, both the device that is down, and the title of the Topology will flash red as shown in the Topology image above. 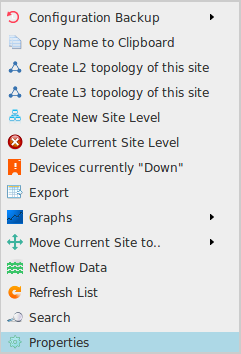 Be sure to click the Save icon in the Topology Toolbar to save your changes. 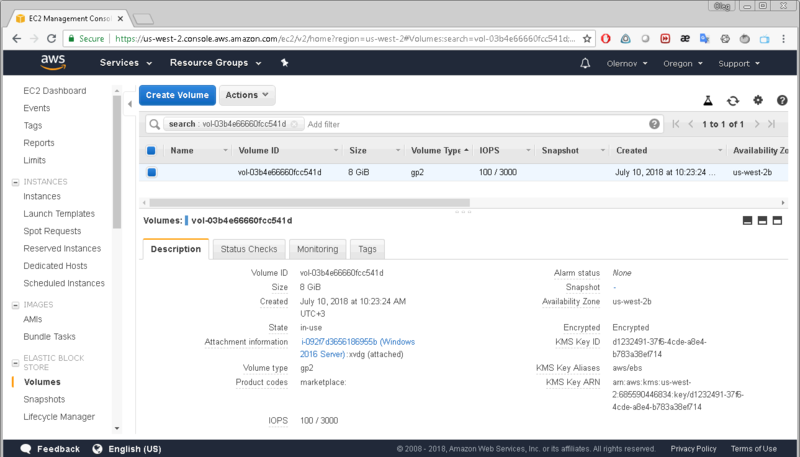 In this chapter, you’ll learn how to create Custom Dashboards. Nectus lets you create an unlimited number of Custom Dashboards, making it easy to focus on exactly the information you need at any time. 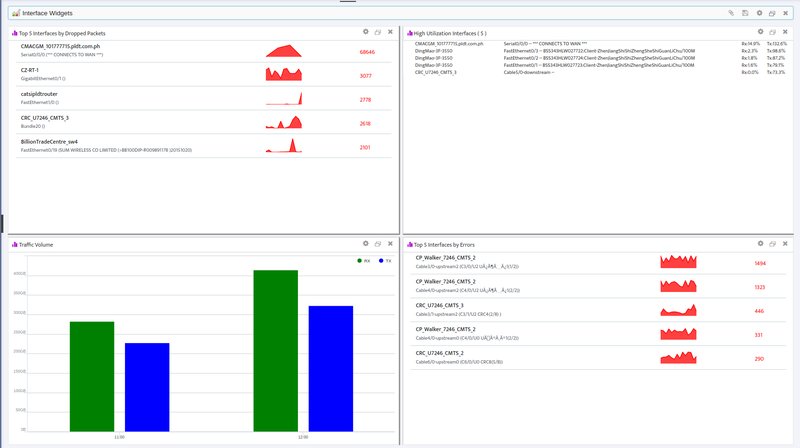 You create and configure Custom Dashboards using the Dashboard Widgets dialog box. 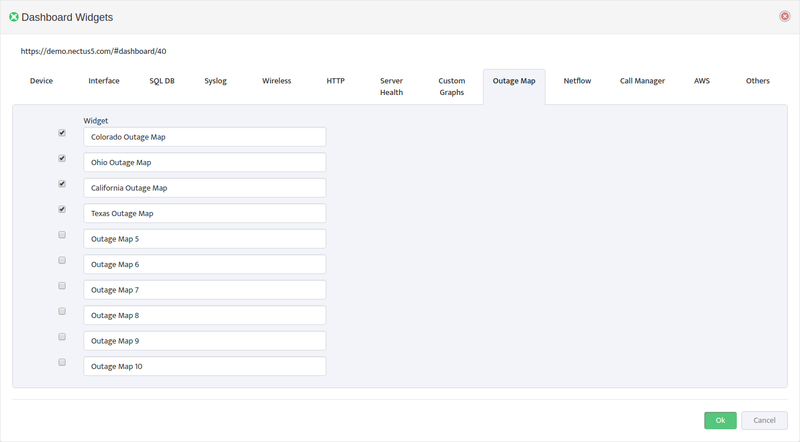 To create a new Custom Dashboard, go to the Nectus Top Menu then navigate to: Monitoring -> Custom Dashboards -> Manage Custom Dashboards and click the Add Dashboard button. 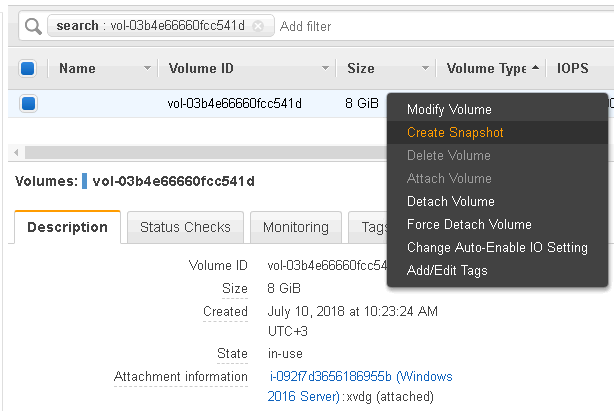 Enter a Title for the Dashboard then add widgets to it as described in Section 2. The Dashboard Widgets dialog includes all the available Widgets grouped by Category. 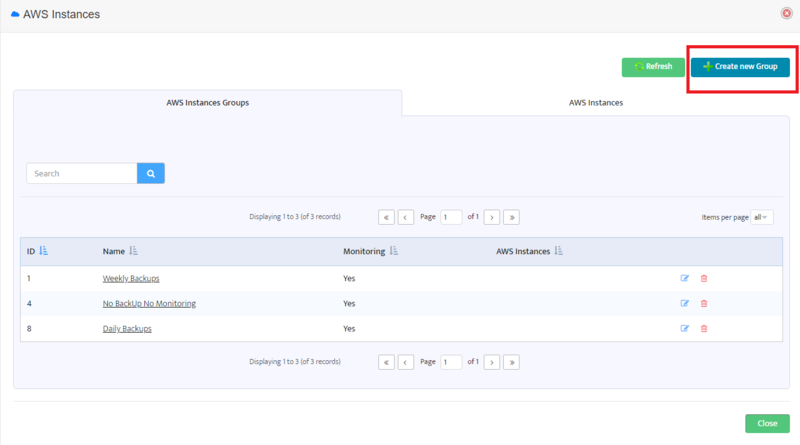 You can enable any number of Widgets from any number of Categories in the Dashboard. Many Widgets have settings you can enter when you add them to the Dashboard. They may also have additional settings you configure once the Widget is live in the Dashboard. See the next section for more details. Once a Widget is live in a Dashboard, you can drag it, resize it, or remove it. You can customize any Widget by clicking its Settings icon. Most Widgets have a Style setting you can configure. Some Widgets also have Views. Views filter the information that appears in the Widget. 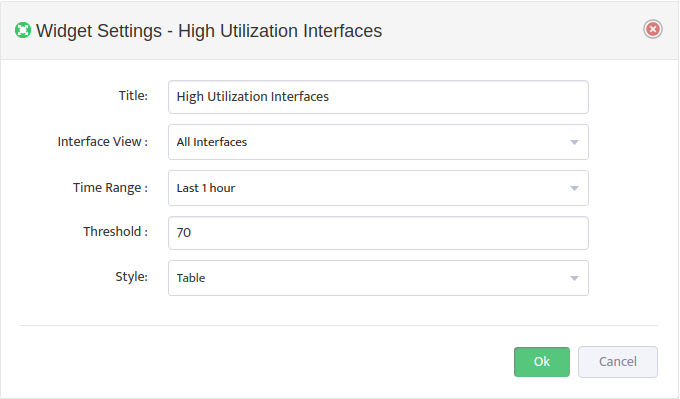 In the following example, the View filters the High Utilization Interfaces Widget so only interfaces that have had utilization levels of 70% of above in the last hour appear. To keep any changes you make to widgets, click the Dashboard’s Save icon. You manage a Dashboard by clicking the Dashboard’s Settings icon to open the Dashboard Widgets dialog box. You can change the Title, as well as add or remove Widgets. To keep any changes you make to the Dashboard, click the Save icon. To make this Dashboard the default, click the Open by Default icon. 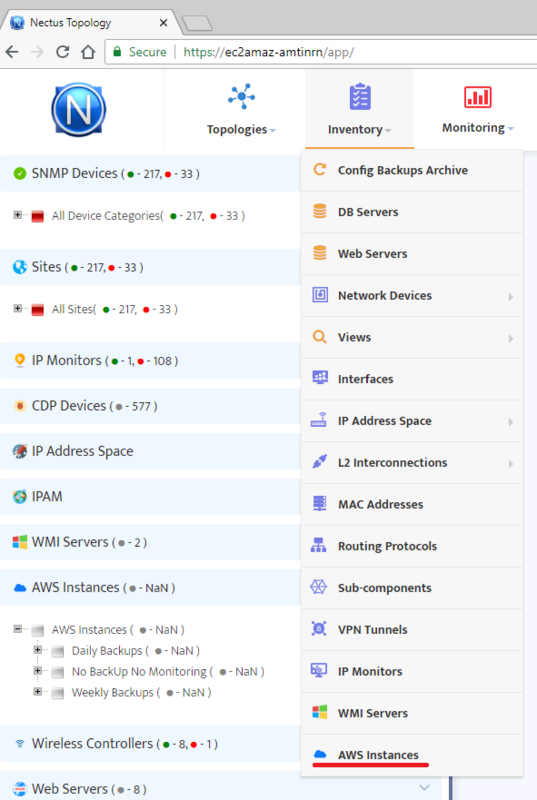 Nectus gives you over 60 Widgets, divided into over a dozen Categories. 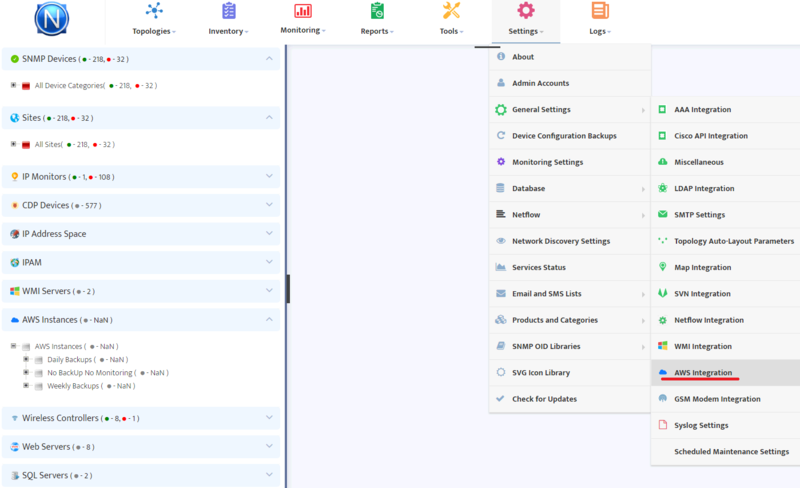 This section lists the Categories and the Widgets in each Category. https://www.nectus5.com/wp/wp-content/uploads/2018/02/logo.png 0 0 Michael Kors https://www.nectus5.com/wp/wp-content/uploads/2018/02/logo.png Michael Kors2018-09-12 14:55:122018-10-29 18:56:45WHICH US CITY USES THE MOST IPV4 PUBLIC ADDRESSES? 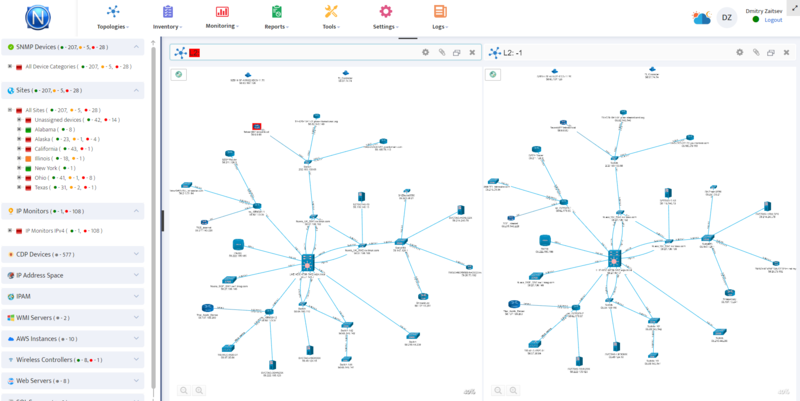 In this chapter, you’ll learn how to create and use Outage Maps. 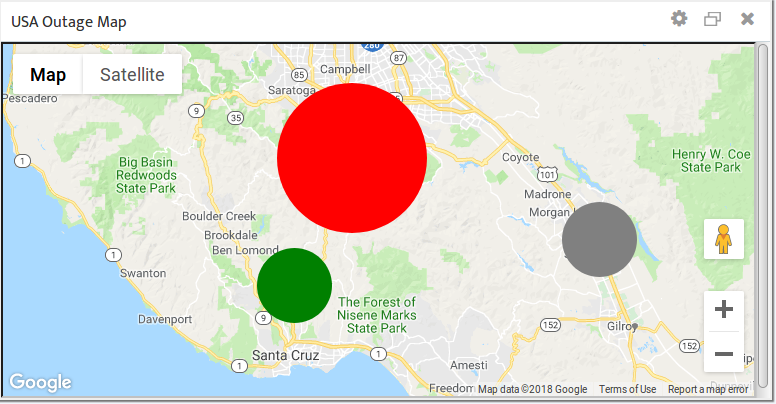 An Outage Map is a graphical representation of the status of the Sites in your organization. 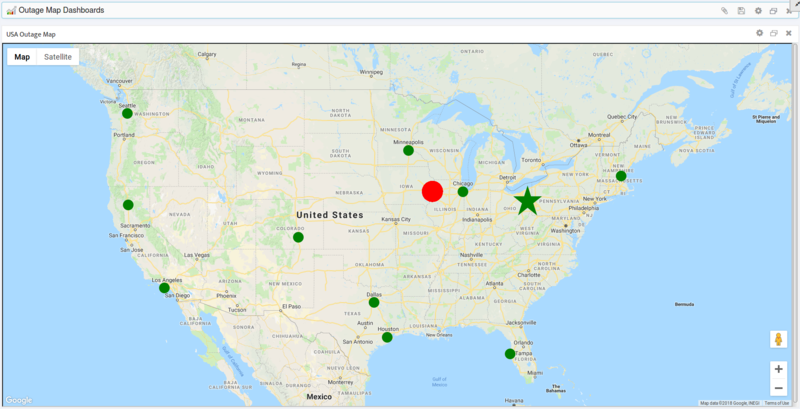 Using real world maps and GPS coordinates, an Outage Map instantly shows you outages for any of your Sites in any region of the world. 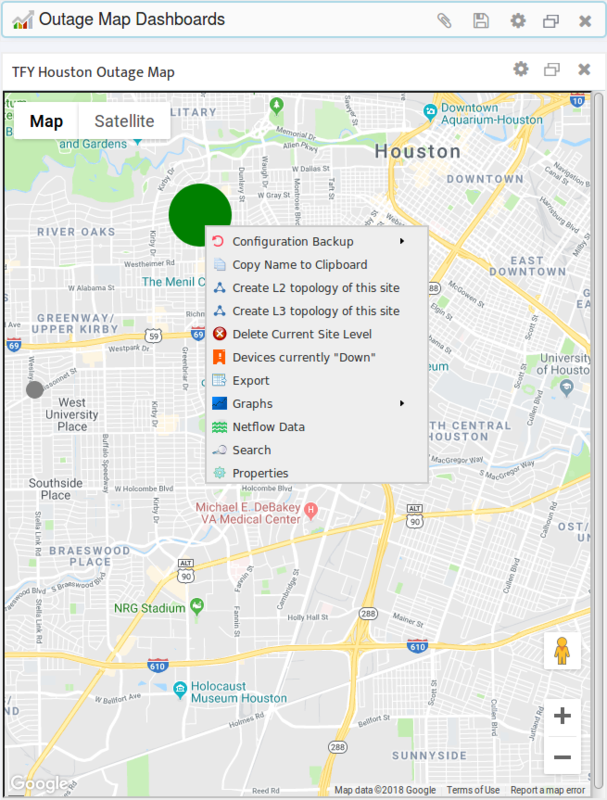 To open the Map Integration dialog, go to the Nectus Top Menu and navigate to: Settings -> General Settings -> Map Integration. 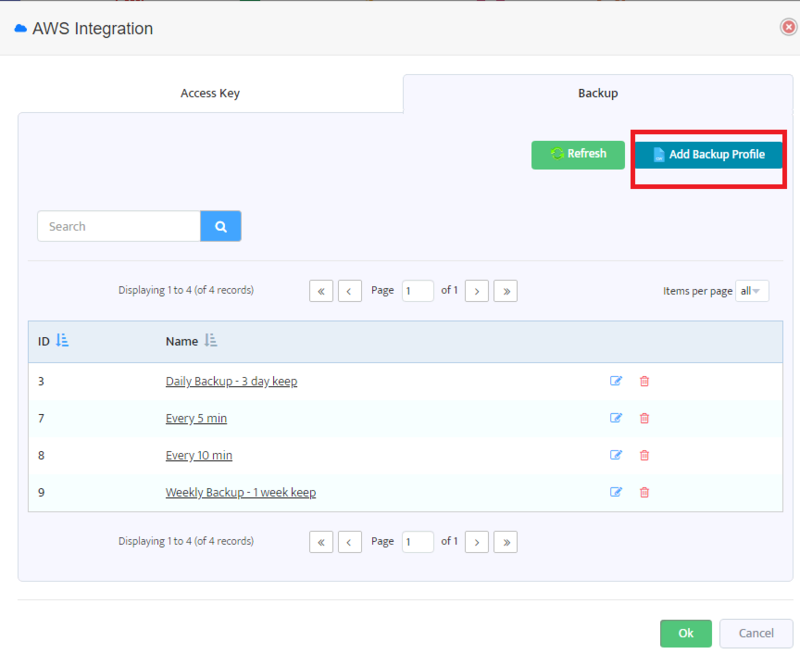 Enter your API Key on the Google Integration tab. 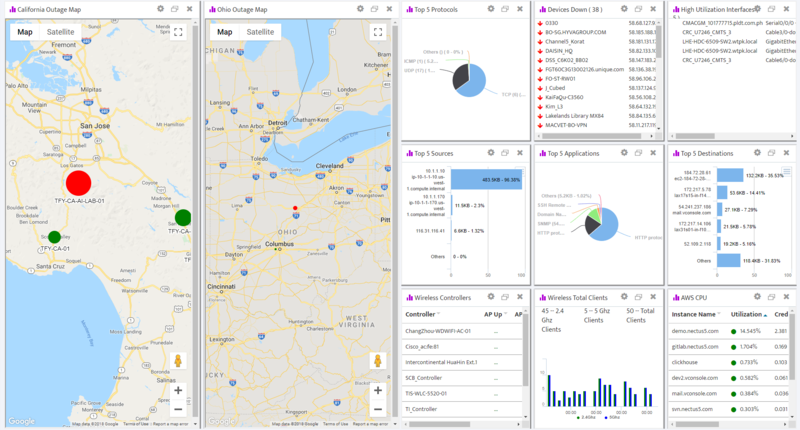 To create an empty Outage Map, go to the Nectus Top Menu then navigate to: Monitoring -> Outage Map Dashboards -> Outage Map Dashboard. Note: Nectus supports up to 10 maps and can display any or all of them simultaneously. 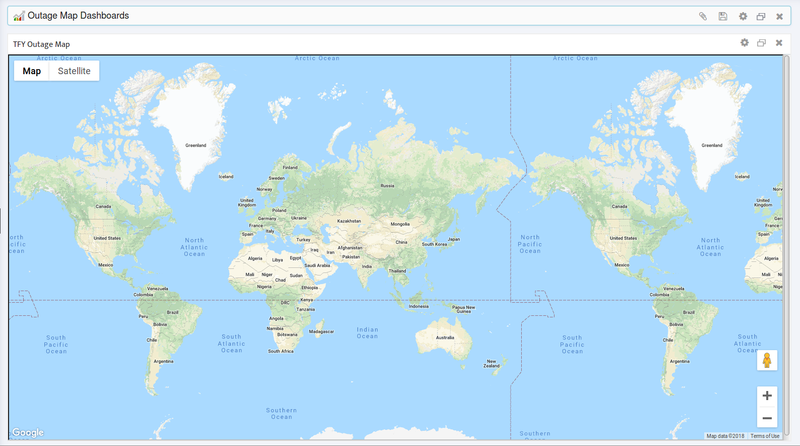 See Section 2.3 for instructions on creating and displaying additional maps. Zoom in to the geographical area you are interested in. Click Save on the Outage Map Dashboard so Nectus will open this map to this geographical location in the future. To assign and save a name, click the map’s Settings button to open the Settings dialog. Enter the new name in the Title field. 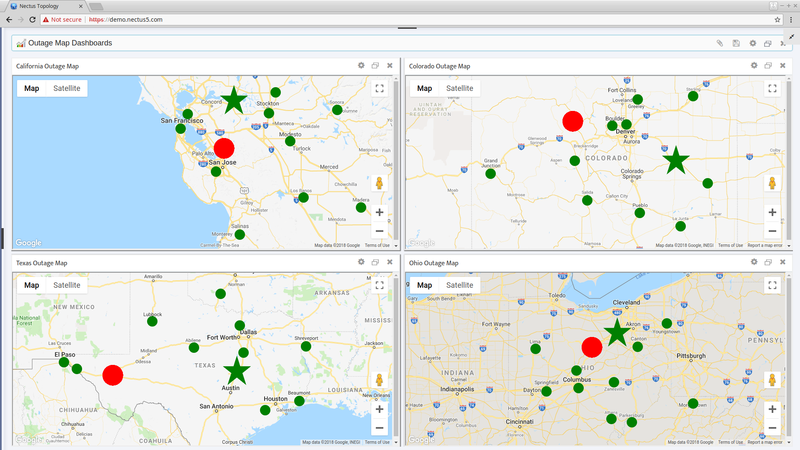 It can sometimes be helpful to display multiple Outage Maps simultaneously. Nectus can display up to 10 maps at once. Each map has its own adjustable settings and can be zoomed and configured independently. 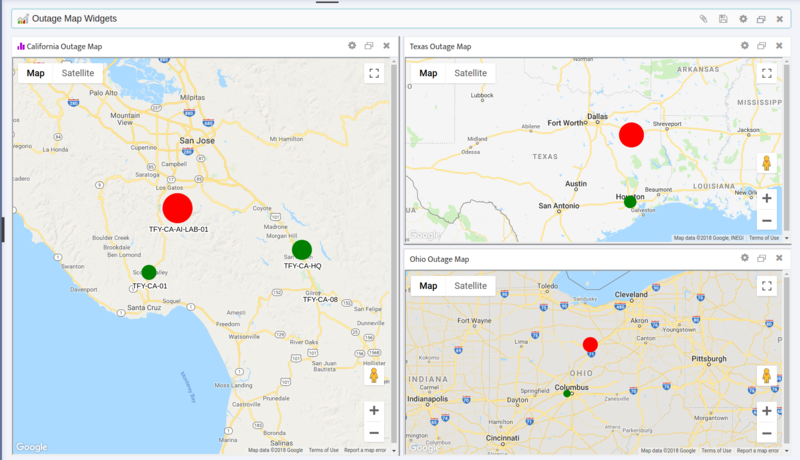 To display multiple maps simultaneously, open the Dashboard Widgets dialog by clicking the Outage Map Dashboards Settings icon. Select the Outage Map tab. 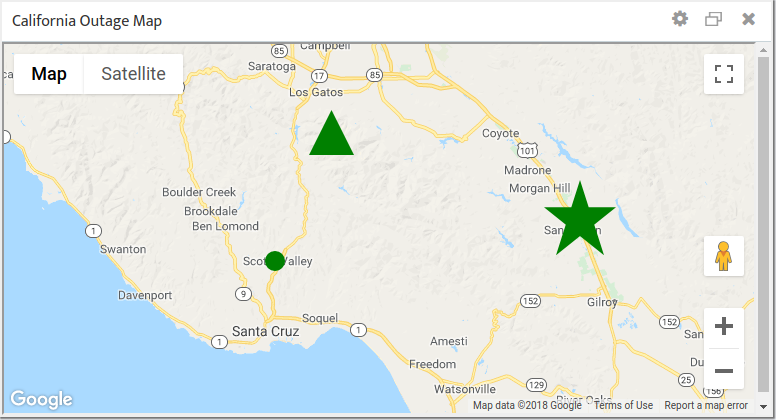 Check the Outage Maps you want to display. You can also edit their names here if desired. Nectus displays all the checked maps. 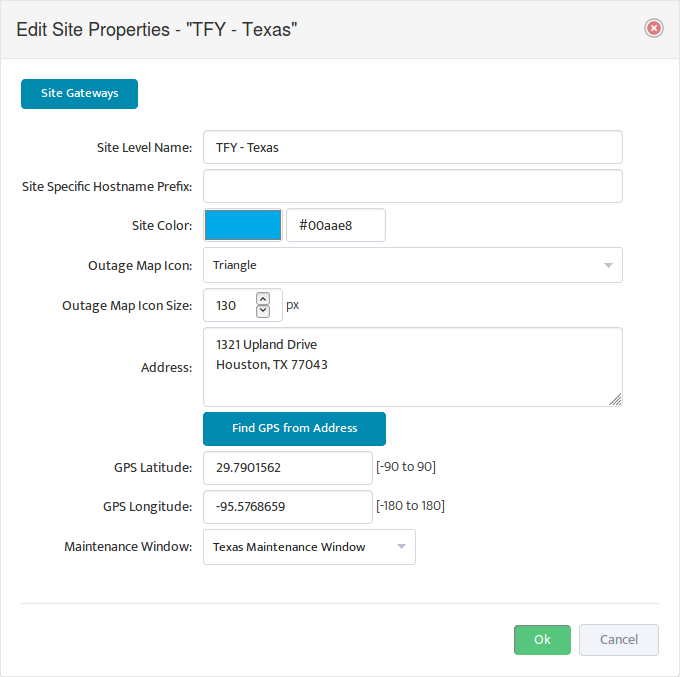 To place a Site on the Outage Map, you need to enter the GPS coordinates in the Site Properties. You can either enter the coordinates manually, or you can let Nectus derive the coordinates of the Site from its Address. Enter the GPS coordinates in the GPS Latitude and GPS Longitude fields. If you don’t know the GPS coordinates of the Site, enter the Site Address and click Find GPS from Address. Nectus derives the GPS coordinates from the Address and enters them for you. Grey – The Site has no Devices assigned to it. Green – All the Devices assigned to the Site are “Up”. Red – One or more of the Devices at the Site is “Down”. When a Site goes Red, Nectus also increases the size of the Site icon to help you spot it more easily. 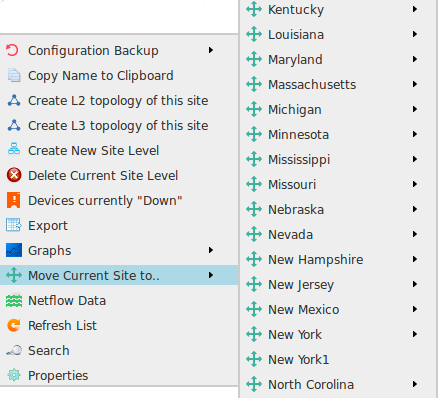 If a Site appears on a map, you can open its context menu directly, without having to navigate through the Sites Panel. Simply right-click the icon of the Site. 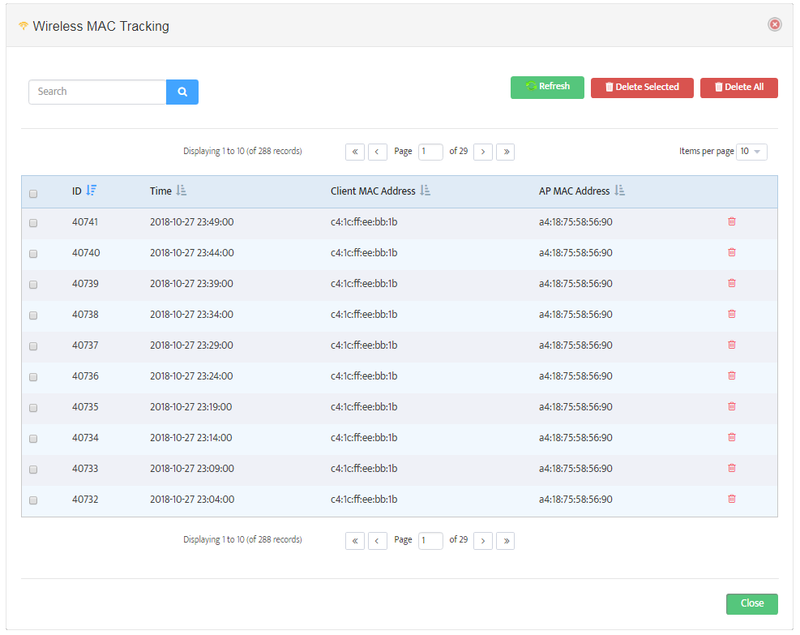 To remove a Site from any and all maps without removing the Site from the Nectus database, clear its GPS coordinates in its Site Properties. An Outage Map has several configurable parameters that control how things appear on the map. You can configure each map independently of the others, giving you maximum flexibility to get exactly the information you need. The following sections show you how to configure these parameters. Changing the shape or size of certain Site icons makes it easy to pick out those Sites on a crowded map. You might make your most important Sites larger than the rest, or assign them a different shape. 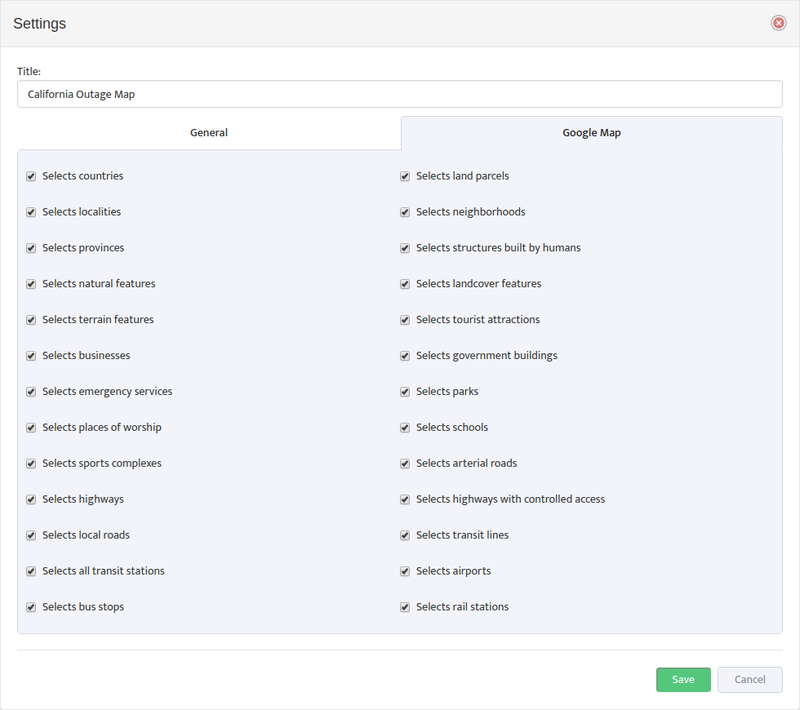 To change the shape and size of individual Site icons, navigate to Site Properties. In the Outage Map Icon Size field select the icon size in pixels. 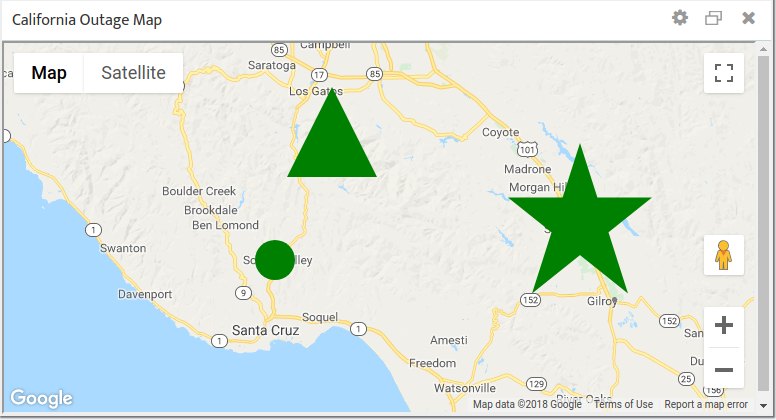 Use the Outage Map Icon list to select a Circle, Star, or Triangle for the shape. To scale all the icons on a map simultaneously navigate to: Map Settings -> General tab. In the Set Circle Radius (%) field enter a scaling factor that will apply to all the Site icons on this particular map. The following figure shows the map from section 4.1 with the icons scaled down to 50% of their original size. 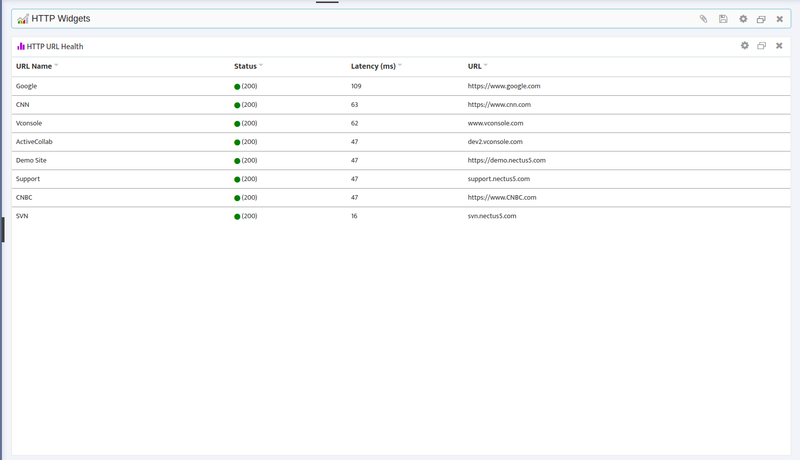 Every Site must have a Site Level Name, but you control whether Nectus displays those names on a map. To show or hide all the Site Level Names on a map simultaneously navigate to: Map Settings -> General tab and check or uncheck Site Name. Outage Maps can display a huge amount of information, not all of which may be useful to you. You can configure a map to display only those objects that are relevant to you. To show or hide all the Site Level Names on a map simultaneously navigate to: Map Settings -> Google Map tab. Check or uncheck Map Objects as desired. 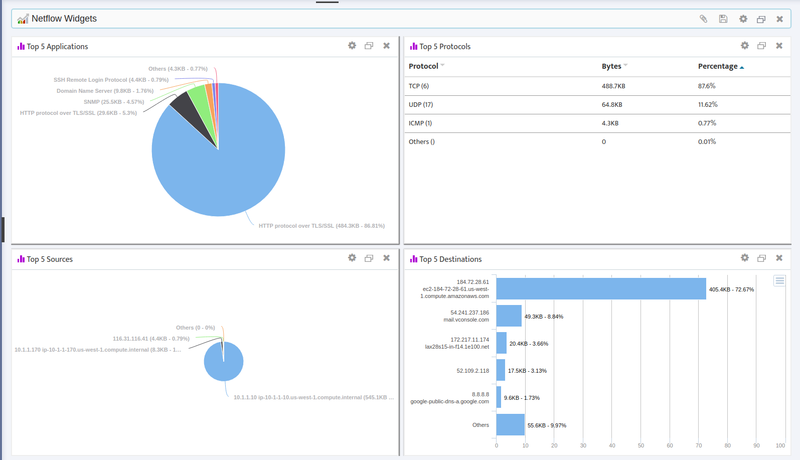 Uptime is one of the most important IT infrastructure operational metrics that gives an overview how “stable” or “reliable” your IT infrastructure is with 99.9999% uptime being a platinum standard. But how do you calculate an Uptime? In ideal (continuous and none-discrete) world calculation of Uptime is somewhat simple. Monitored Objects achieving “six nines” uptime should only be “down” for a maximum 31.5 seconds in the 365 days. 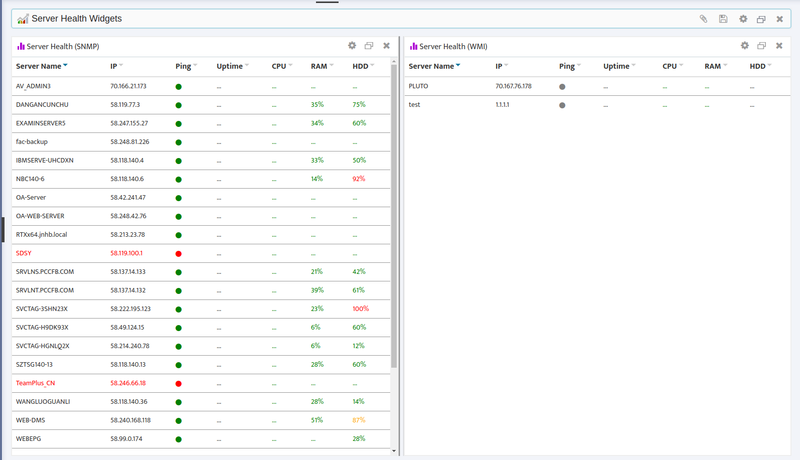 But as you get to “six nines” or higher, capabilities and configuration of monitoring tools starts to play critical role in accuracy of uptime calculations. 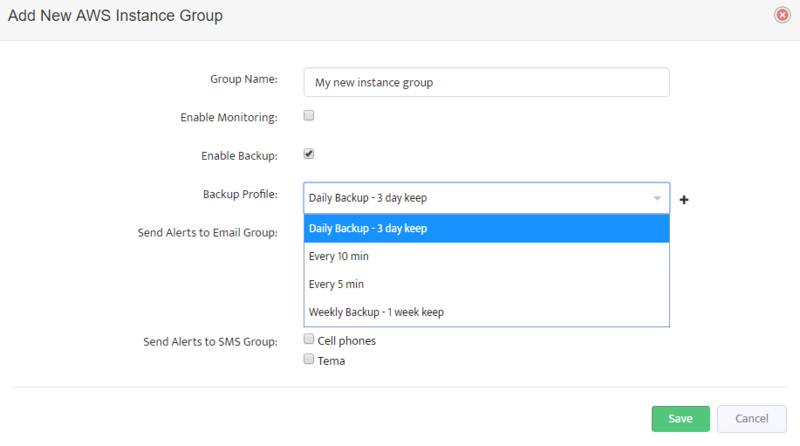 Let’s start with an example of Uptime calculation for a single device such as a Server. First, we need to define what constitutes a server being up or down and what tools we planning to use to determine its state. Let assume that we use a classic ICMP v4 probing with ‘Polling Interval” equal to 1 second. 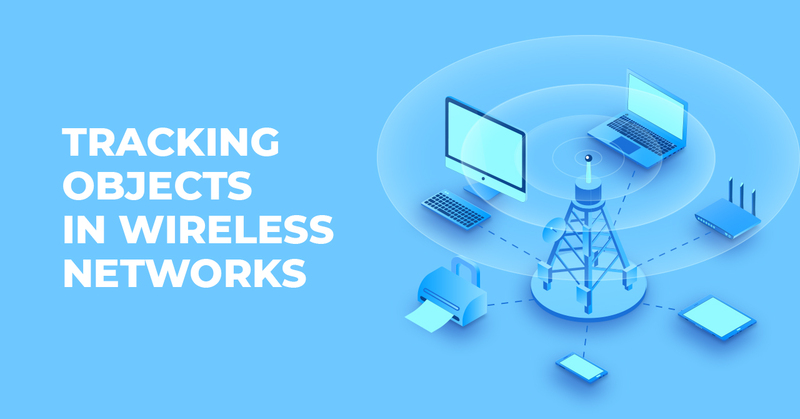 In other words, we will be sending Ping packets from a monitoring agent to the Server every 1 second and if server does not respond we shell consider it down. Well, may be in perfect world yes, but we live in real world and packets may get lost for reason other than Server being down. of consecutive packets that must be missed to consider Server to be “down” to a number greater than 1. Let’s call this number an “Assurance Multiplier”. Greater “Assurance Multiplier” values shell result in greater probability that we detect an actual Server down event. But at the same time greater “Assurance Multiplier” will result in slower detection time for Server down events and inability to detect short-lived outages with duration time less than (Assurance Multiplier * Polling interval) seconds. 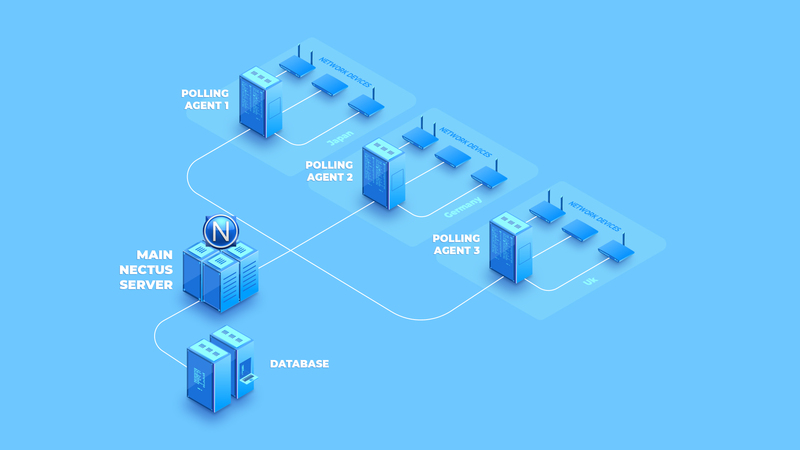 We also need to introduce two new parameters: “Actual Outage Duration” and “Detected Outage Duration” to reflect the fact that duration of the Server outage calculated by monitoring agent may be slightly greater than actual outage of the Server due to the fact that duration of polling interval is > 0. “Polling Interval” – Time between two consecutive state polls. “Assurance multiplier” – Number of consecutive polling intervals when object’s state must be Down to consider monitored object to be truly down. “Outage Detection Time” – Time is takes for monitoring Agent to detect an outage of the monitored object after outage has started. “Actual Outage Duration” – Actual Outage Duration of the monitored object. “Calculated Outage Duration” – Duration of the Outage as calculated by the monitored object. 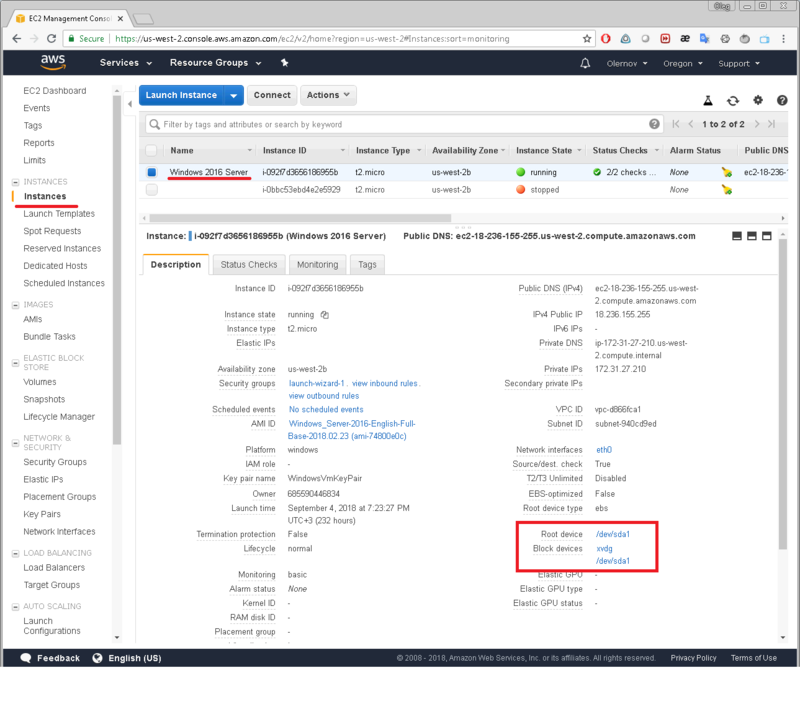 Now we can see that provided example of Monitoring Agent configuration is sufficient for grading Server’s Uptime as 99.9999% but not sufficient for 99.99999% classification. To classify monitoring tool for 99.99999% accuracy you need to decrease Polling Interval or decrease Assurance Multiplier by at least 30%. 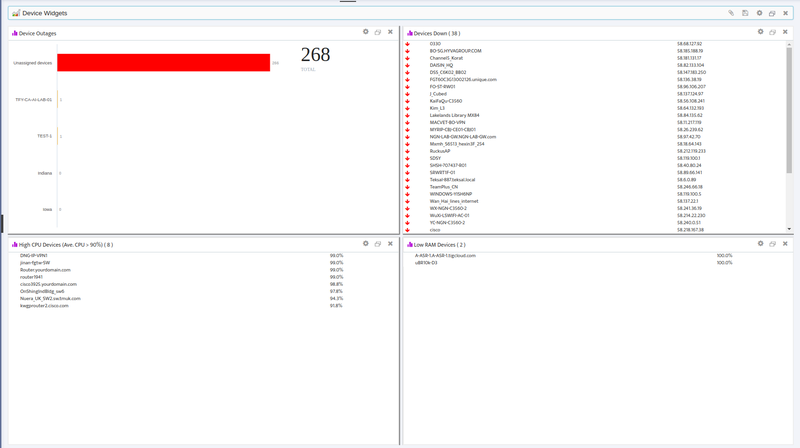 So next time when you see a 99.99999% Uptime calculated by a Monitoring tool with a Polling interval of 5 minutes you know that it is likely not true. 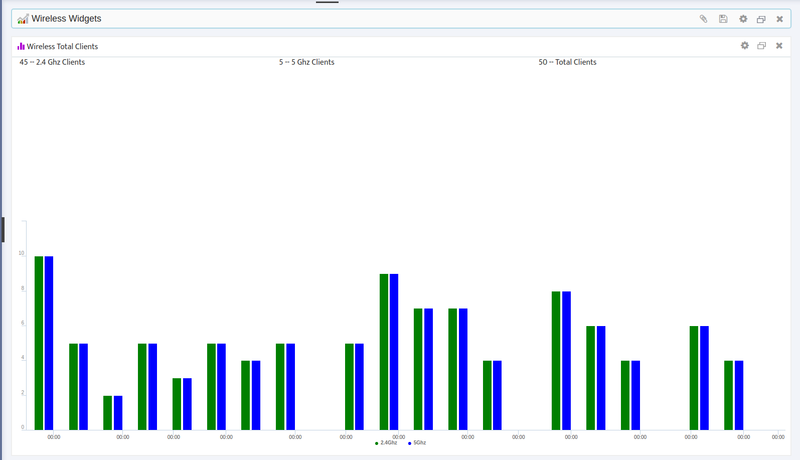 It gets more interesting when we move into calculation of Uptime for a Network rather than a single object like Server. 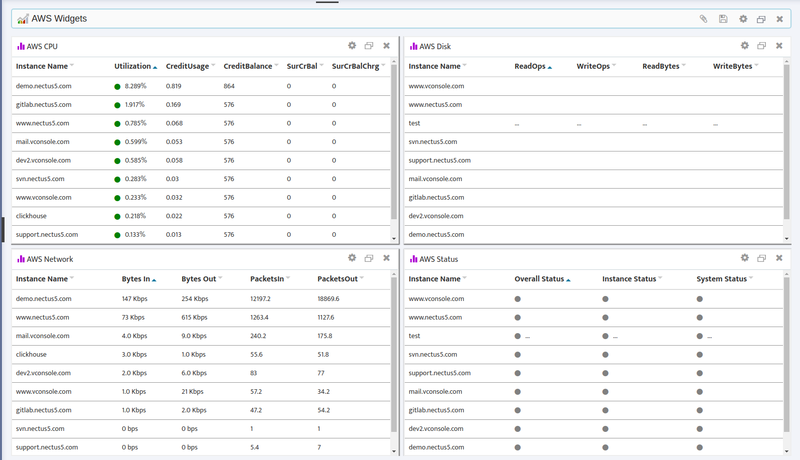 In this chapter you’ll learn how to create a Hierarchical Site Structure in Nectus and populate it with Devices. This activity is fundamental to using Nectus. In the Sites Panel on the Nectus Home screen, click Sites. The “All Sites” list appears. Right-click All Sites. 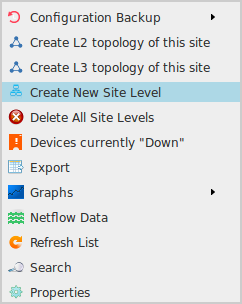 In the menu that appears, click Create New Site Level. 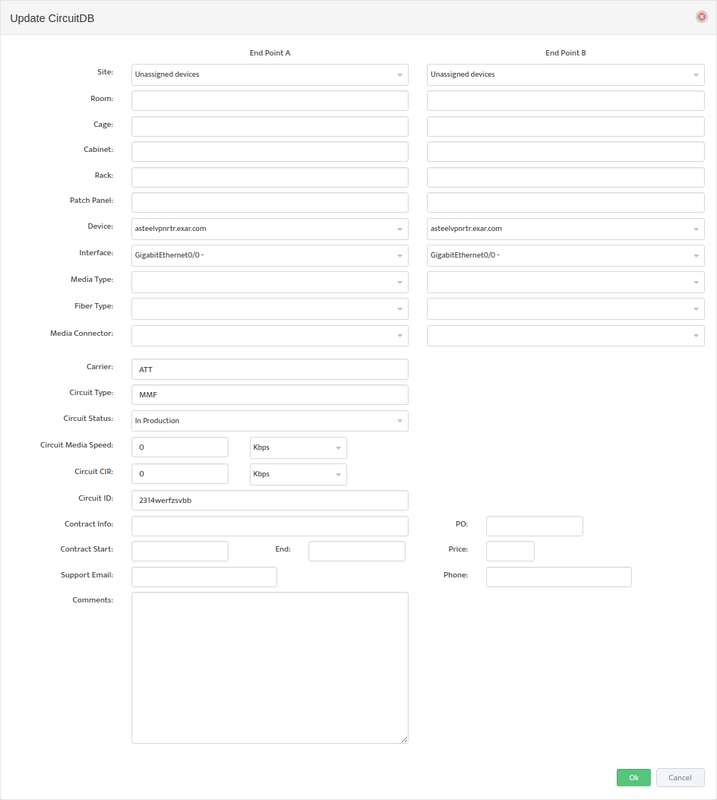 In the Create New Site Level dialog box that appears, enter the Site Level Name and any other information relevant to the Site you are creating. 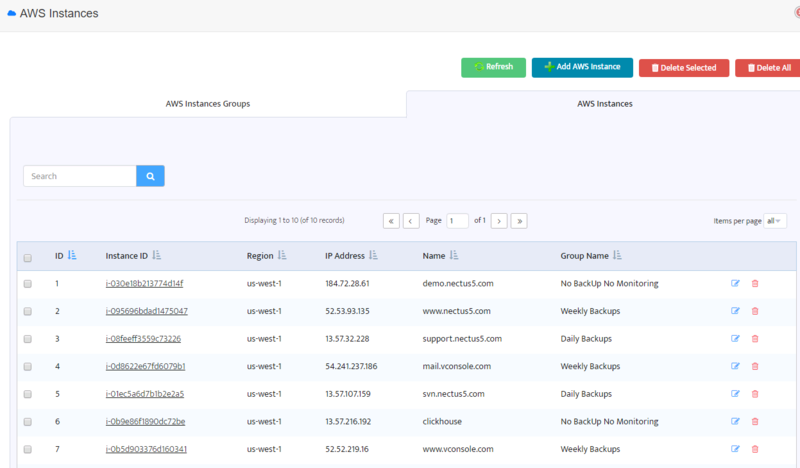 Click Ok to add the Site to your Nectus Hierarchical Site Structure. Click Sites in the Sites Panel on the Nectus Home Screen. The “All Sites” list appears. Open the All Sites list by clicking the plus sign ( + ) to the left of the list. Navigate to the Site you want to delete and right-click it. In the menu that appears, select Delete Current Site Level. A confirmation dialog box appears. Click Ok to delete the Site. Click Sites in the Sites Panel on the Nectus Home Screen. Open the “All Sites” list and navigate to the Site you wish to move. In the drop-down menu that appears, hover the cursor over the Move Current Site to… option. A list of all the top-level Sites in your hierarchy appears. 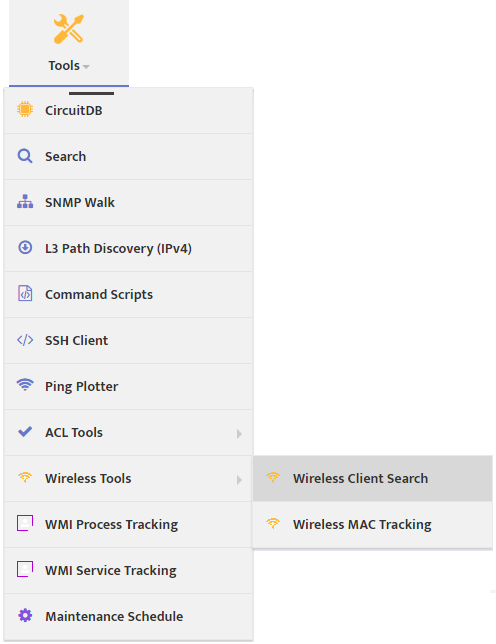 Hover the cursor over a location in this list to see a list of any Sites under this location. Click a location to place your original Site under that location. Clicking All Sites in the hierarchy moves your Site to the top level. In the Sites Panel of the Nectus Home screen, click Sites. The “All Sites” list appears. 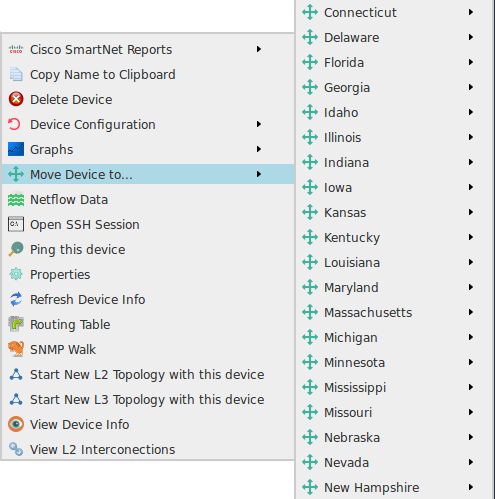 Open the Unassigned Devices list by clicking the plus sign ( + ) to the left of the list. Right-click the Device you want to add to a Site. In the menu that appears, hover the cursor over the Move Device to… option. A list of all the available top-level Sites appears. Navigate through the Site hierarchy by hovering the cursor over Sites to view their sub-sites. Click the Site you want to add the Device to. 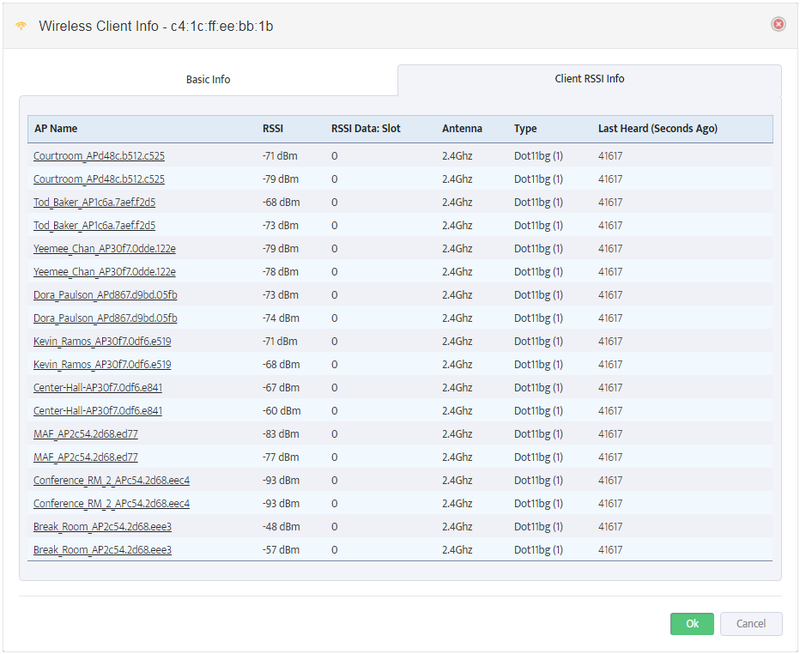 The Device moves from the Unassigned Devices pool into the Site you selected. In the Sites Panel on the Nectus Home screen, click Sites. The “All Sites” list appears. 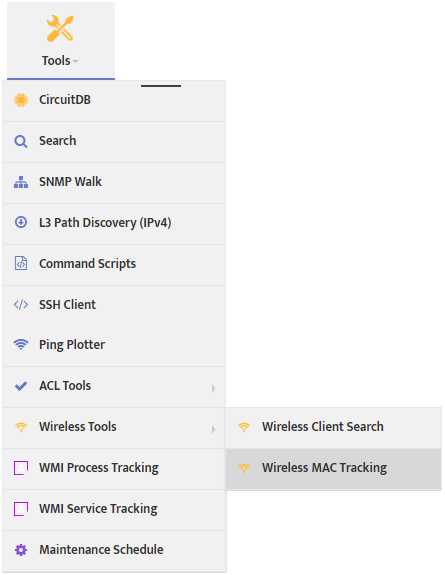 Navigate to the Site that contains the Device you want to delete. Open the Site by clicking the plus sign ( + ) to the left of the list. The Device appears below the Site. 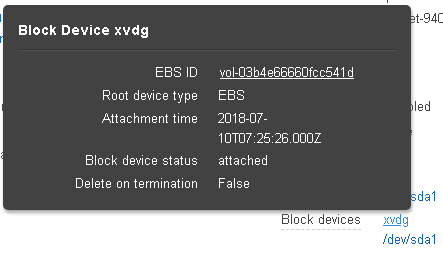 Right-click the Device name. A menu appears. Hover the cursor over the Move Device to… option. A list of your top-level Sites appears. 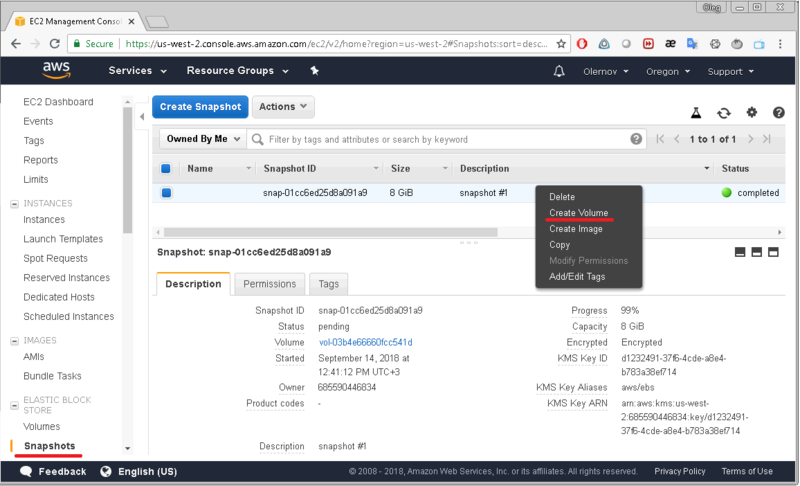 Select Unassigned Devices in the list to delete the device from the Site and return it to the Unassigned Devices pool. Navigate through the hierarchy of Sites and click the Site you want to move the Device to. 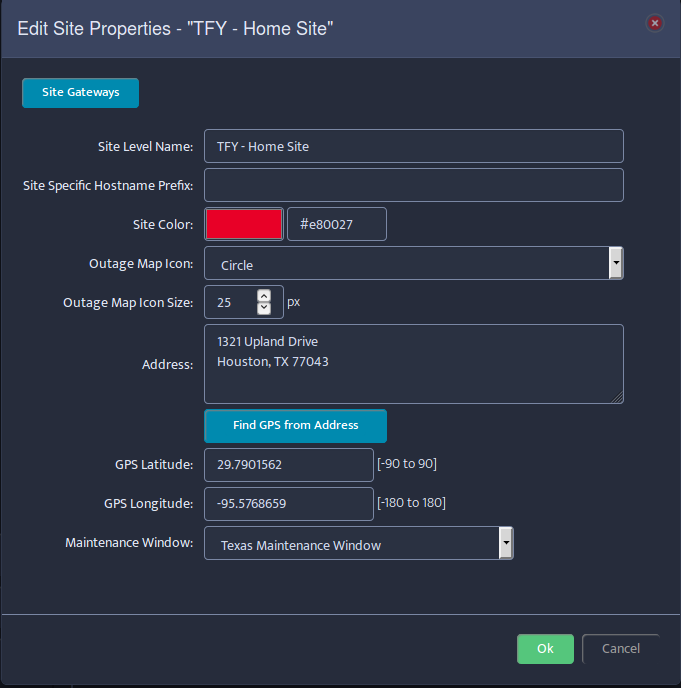 You can easily edit the properties of any existing Site. In this chapter, you’ll learn how to edit the properties of an existing Site. We’ll also discuss the functions of each editable property. Navigate to the Site you want to edit and right-click it. In the menu that appears, select Properties. The Edit Site Properties dialog box appears. Make your desired edits (details about each editable property follow). Click Ok when done. 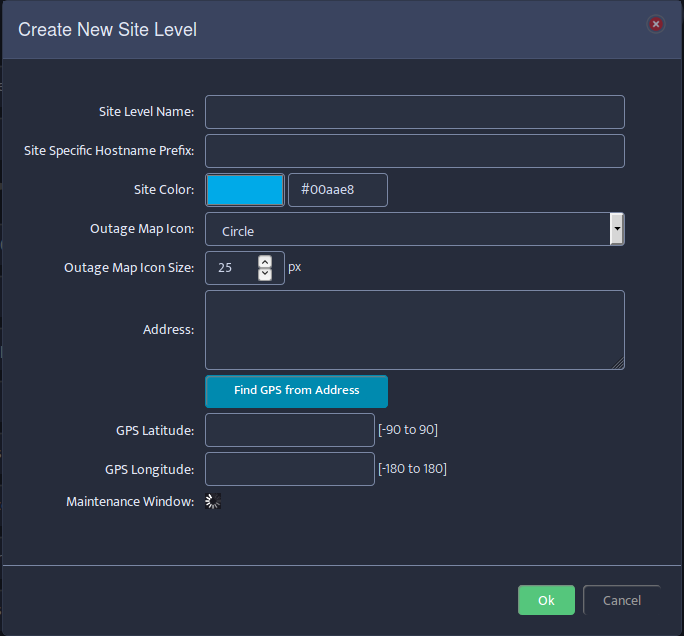 Site Gateways Button: Opens the Site Gateways dialog box and displays all the potential gateway Devices for this Site. Site Level Name: A unique identifier for the Site Level. You can assign any name you wish. Site Specific Hostname Prefix: Setting a hostname prefix here will automatically assign to this Site any unassigned Devices with the same prefix. This feature is currently disabled. Site Color: The color to use for Devices that are assigned to this Site. Click the colored block to select a color, or enter the ASCII color name. Outage Map Icon: A clickable list of icons that can be used to identify this Site. The options are Circle, Triangle, or Star. Outage Map Icon Size: Allows you to adjust the size of the icon that represents this Site. Typically used to make the icons for more important Sites larger. Address: The street address of the Site. Can be used to generate the GPS Latitude and Longitude of the Site. Find GPS from Address Button: When you click this button, Nectus uses Google Maps to find the GPS Latitude and Longitude of the Site. GPS Latitude: The Latitude of the Site. 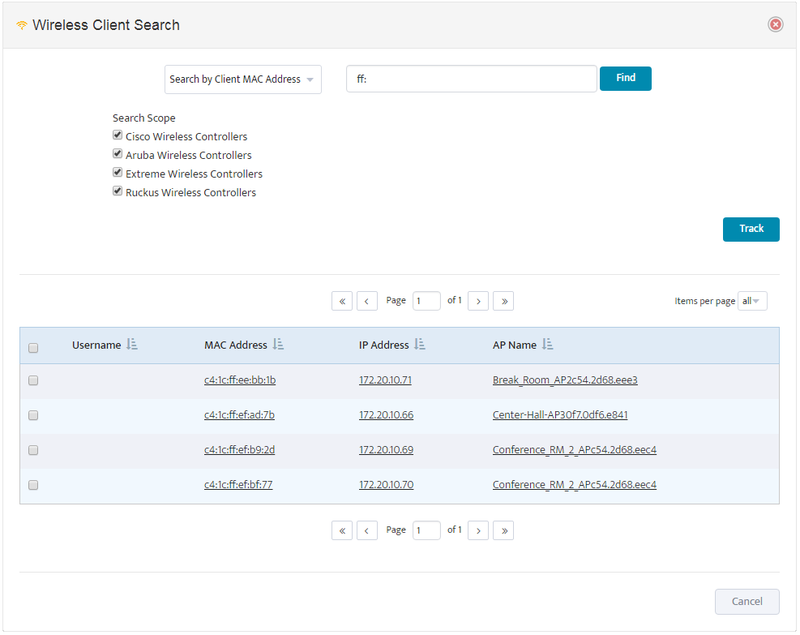 You can enter a value manually, or let Nectus populate this field using the “Find GPS from Address” button. GPS Longitude: The Longitude of the Site. 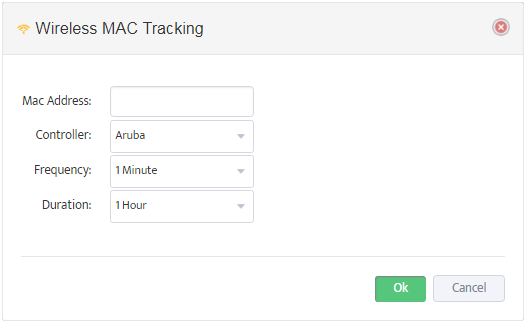 You can enter a value manually, or let Nectus populate this field using the “Find GPS from Address” button. Maintenance Window: Shows the time frame when Site administration is allowed. Click to select from a list of available maintenance windows. These windows are defined at Settings / General Settings / Scheduled Maintenance Settings.